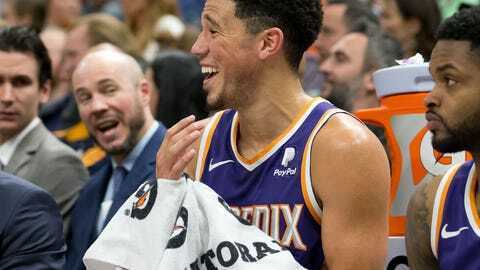 Devin Booker’s scoring spree is jazzing up the end of another lost season for the Phoenix Suns. The star shooting guard is just one of 10 players in NBA history to record consecutive 50-point performances, and he will strive for another high-scoring outing when the Suns host the Memphis Grizzlies on Saturday. The 22-year-old Booker scored 59 points in Monday’s 125-92 road loss to the Utah Jazz and followed up with 50 in Wednesday’s 124-121 home setback against the Washington Wizards. Tom Chambers (twice in 1990) is the only other Phoenix player to score 50 or more points multiple times. Overall, reaching 50 has happened on eight occasions after Booker’s back-to-back efforts. “It’s a blessing,” Booker told reporters after the loss to Washington. “It’s an honor, I say it every day, to lace it up and play a sport that I love. Booker, who averages 26.5 points on the season, was on a nice run even before the pair of 50-point explosions. He has posted a career-long 17 straight 20-point outings, reaching 25 or more in each of the past nine. The only player in franchise history to string together more consecutive 25-point outings is Amar’e Stoudemire, who registered 11 straight during the 2007-08 campaign. Of course, 25 is only half of 50 — an amount Booker has reached three times in his career, including his career-best 70-point output against the Boston Celtics on March 24, 2017. The huge performances haven’t resulted in victories. The loss to the Wizards was the fifth in a row and seventh in eight games for the Suns. Memphis is also struggling with five setbacks in seven games as it opens a four-game road trip. The Grizzlies dropped a 118-103 home decision to the Golden State Warriors on Wednesday on a night in which point guard Mike Conley became the franchise’s all-time scoring leader. Conley scored 22 points to raise his total to 11,700, surpassing the 11,684 scored by Gasol, who was traded to the Toronto Raptors in February. “It’s an honor, man, it really is,” Conley told reporters afterward. “Just to be amongst one of those guys up there on the top of the board in Marc Gasol. Big Spain is one of my best friends and even to be mentioned next to him is awesome. While Conley is a known commodity, Memphis is still figuring out center Jonas Valanciunas, who came over from Toronto in the Gasol trade. The 7-foot Lithuanian posted 27 points and 13 rebounds against the Warriors for his fifth straight double-double. He is averaging 24.2 points and 16 rebounds during the stretch. The teams have split this season’s two meetings but Phoenix has won four of the past six overall matchups.